John Stuart, and the Brigade trails in B.C. From 1843 to 1850, the New Caledonia brigades traveled over the trail lightly marked in pencil on this map. In 1851 Peter Ogden made a new trail that cut off the big loop to the east. So there are two trails to find that run between Green Lake and “Drowned Horse” [Horse] Lake. Image from A.C. Anderson’s 1867 Map of British Columbia, CM/F9, Courtesy of the Royal B.C. Museum, B.C. Archives. Detail from Original Map. In 1805, the Nor’Westers Paul Fraser, and John Stuart, entered New Caledonia via the Peace River, establishing a post at Trout Lake [McLeod Lake]. Fraser left Jean Baptiste Boucher [Waccan, La Malice] in charge of the Trout Lake post while he spent the winter on the Peace River. In the spring they returned, and established a post at Stuart’s Lake. This post was later called Fort St. James. Paul Fraser left the territory in 1809. John Stuart took the furs out to Rainy Lake that summer and was posted east of the mountains. In 1812 Stuart returned to the district and was sent to winter at Stuart’s Lake. His new assignment was to organize the district and co-ordinate affairs with the Lower Columbia district, where the NWC had two or three posts already established. Because of Simon Fraser and Paul Stuart’s exploration of the Fraser River in 1807, Stuart knew that the Fraser would not bring him to the Columbia district. Somehow, he had to find his way to the post at Kamloops, from which he knew a river led south to the Columbia. Though his departure from Stuart’s Lake was delayed by bad weather, he eventually set out on his voyage to the sea [Astoria] on May 13, 1813. His furs had already gone out via the Peace River: he traveled light, with nine men in two canoes. Stuart’s job was to find and open a trail so the New Caledonia men could import a a good supply of provisions and trade goods from the mouth of the Columbia, rather than bring everything overland by the canoe routes from Rainy Lake, the North West Company’s transportation post north of Thunder Bay, Ontario. 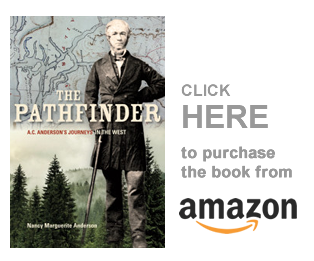 The major objection to this new route, Stuart felt, was that he must make his way overland on horseback, some 150 miles from the future location of Fort Alexandria [established 1821] on the Fraser River, to Lake Okanogan. We do not know what trail Stuart used to make his way from the Fraser River to Kamloops. Later brigade trails went over the “mountain” to the North Thompson River and followed it south. There are stories of the brigades having traveled down the Deadman River valley to Kamloops, and some stories tell of gardens and posts that existed long before the HBC’s brigade trails existed. At first I thought they may be built as a secure shelter for “en derouine” voyages from Kamloops. Now I am not so sure. It would appear, however, that the North West Company had earlier conceived of such a post between Okanogan and Kamloops: “One of these [outposts] in charge of Mr. Montigny, assisted by a man named Pion, was placed on the peninsula between the two arms of Okanagan Lake, near its head.” [according to George Mercer Dawson, in his Notes on the Shuswap People of British Columbia.”] It is surmised that the Nor’Westers used canoes on the lake and that the post at the head of the lake was mainly a transhipment point. [Ken Favrholdt, “The Cordilleran Communication,” UBC thesis, p. 77]. When my sister and I explored this road, we took the road that led to Cache Creek rather than continue up the valley. Now I am sorry we did not explore further, but at that time I did not know where the brigade trail ran and was only looking to locate Criss Creek. However, Liz Bryan continued past the Cache Creek Road and followed the Deadman River road past the Split Rocks, and the hoodoos. After Mowich Lake comes Snohoosh Lake, Skookum, Deadman, Outpost Lake, and finally Vidette. I wonder how Outpost Lake got its name? This long skinny lake [Vidette Lake] was the half way point on one of the Hudson’s Bay brigade Trails between Fort Kamloops on the Thompson River and Fort Alexandria on the Fraser. 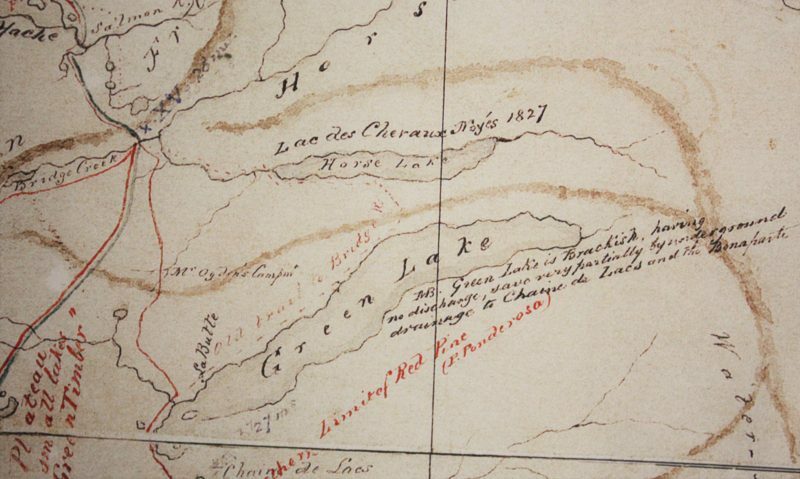 According to all the information we have from numerous sources, the 1843 Brigade trail did not go up this valley as far as Vidette Lake, nor even as far as Mowich Lake. But what if an early North West Company post was located here, or at tiny Outpost Lake? What if John Stuart’s horse road (not a brigade trail, as he was not carrying out the furs) led north past Vidette Lake and followed the creek flowing into its west end to Loon Lake? There was an HBC post on Vidette Lake in 1862, apparently. Was there an earlier, almost forgotten NWC post? People who live in the area seem to think so. The property was first used as a stopover for trappers and fur traders on their way along the Alaska trail going to and from the Yukon Territory and Alaska. A major trail used by the Cariboo Fur Brigade is the same trail our guests use to ride out of the corral today. In the 1820’s, the Northwest Fur Trading Co. established a fur trade post at the ranch’s location on Green Lake. So John Stuart made his way to the Columbia River, meeting John George McTavish at Fort Okanogan in August 1813. McTavish knew the ship had not yet arrived at Astoria, and both men went to Spokane House. The express then came in from Lachine, bearing news of the start of the War of 1812. To make a long story short, the two men rushed downriver to Astoria, where McTavish told the Pacific Fur Company men of the war, and made an offer to buy them out. The offer was accepted: taking inventory at the various posts commenced, and John Stuart was kept busy for a while. The North West Company’s ship arrived about April 21st, and Stuart might have been part of the brigade that left newly renamed Fort George [Astoria] on May 1st, with ten canoes and 78 men. The incoming provisioning brigade reached Stuart’s Lake at the end of August 1814, but whether this is Stuart’s “brigade,” or a second one, is not known. In 1814, no men left Fort St. James for the Columbia. It was not until 1820 that they made another attempt at bringing in part of its outfit from the Columbia. The furs were sent east via the Peace River, but the men sent south to the Columbia departed in June. Hugh Faries expected to return in October, and he did: he reached Stuart’s Lake on October 20, 1820, with enormous loads of provisions. In 1821 and 1822, New Caledonia was again outfitted from the Columbia, but still did not send their returns there. In 1821, John Stuart set off very early in the year and used dogs and sledges until he got to Fort Okanogan. He was delayed at Fort George [Astoria] and finally departed on June 7, reaching Stuarts Lake on October 12, 1821. In 1822, Hugh Faries left Stuart’s Lake for the Columbia on May 1, while the furs went out by the Peace. Faries made the fastest journey yet, returning to Stuart’s Lake in the first days of October. But this was the last journey. In 1822 William Brown told Governor Simpson that the route to the Columbia had been abandoned, and for the next three years the provisions came in by the Peace River route. No one knows what route these men used on their way south to the Columbia. If they crossed the Thompson River at the Deadman, they would have had to make their way through the Nicola Valley and north over the hills to Kamloops, which seems a long way around. Whichever route they traveled — whether North River or the Deadman [or Bonaparte] to the Thompson River, it appeared that Kamloops post was responsible for providing canoes for the portage of the river: in 1820 that was true at least. But the fact that there might have been posts at Green Lake, and at Vidette Lake, does suggest, perhaps, that they passed through those posts. But really, we don’t know; and we may never know. I think I have sorted out this varying information more or less correctly. Information on John Stuart’s journeys come from Jamie Morton’s “Fort St. James, 1806-1914;” James Gibson’s Lifeline of the Oregon Country; Lloyd Keith and John Jackson’s The Fur Trade Gamble; and Ken Favrholdt, “The Cordilleran Communication.” I do have some HBCA documents to look at that might change this, so I may rewrite it again: blogposts are made to be edited when new information is uncovered. If you have any information to add to this, especially re: the posts on Green Lake and Vidette Lake, please let me know. The Flying U isn’t for sale – only a parcel of land that once belonged to the Flying U. The flying U just purchased the Spring lake Ranch at Green Lake (not the one at Lac la Hache) to add additional riding land for their guests. Thanks. I saw the Spring Lake Ranch, but it seemed to be far to the north of the Flying U (and it might have been the one at Lac La Hache). Always happy to be corrected, especially by someone who lives in the immediate area. I see by your Facebook post that there really is still a ton of snow up there! Yes, the Spring Lake Ranch acquisition announcement caused some confusion even locally because the other one is well-known. The Flying U clarified which one they purchased on their Facebook page….. And it is still snowing here…….. Enjoying your regular posts and the comments. I alway wonder if I have camped in the same places you describe. I found Alexander Ross’ book from 1855 on Google Books, with its title of “fur hunters”, not “fur traders”. I had not seen it before and look forward to reading it, esp. as a word search reveals there are references to the use of songs, a topic of interest to me and often little mentioned in the journals. Songs? Voyageurs? You will want to read my York Factory Express book then. Thanks for commenting. I have that book, I think, so will now get to follow up on the songs too.